Strikingly, the book is written by literary scholars and is arguably the most interdisciplinary of those under discussion, an approach that significantly enriches and complicates the work. It moves between economic, scientific, cultural, political, social, and literary processes to uncover the multiple ways in which tea became a quintessentially British foodstuff. […] Empire of Tea shows the long and difficult process of naturalization by examining a range of activities from literary discussions to economic legislation, marketing infrastructure, and scientific knowledge. [Empire of Tea] sheds light on the complex transformation tea consumption underwent from a luxury to a necessity, from many angles. […] The end result is a very rich history, beautifully illustrated and carefully argued, which goes a long way towards explaining the continuous consumption of tea in Britain and beyond. [Empire of Tea] is a great summation of the history of the British adoption of tea and the cultural reception to this drink. The book has high production value and is wonderfully written; the prose flows seamlessly, never for a moment betraying its origin as a manuscript with three authors. It is essential reading for anyone interested in the history of tea. Empire of Tea is a beautifully written and illustrated cultural history of tea. […] The strength of this book is in its […] focus on the cultural history of the incorporation and transformation of tea into British society, primarily in the eighteenth century. As the authors show, this is the crucial century — though understudied until now — for understanding how tea came to be a central force in British society. This is a fine addition to the myriad histories of foodways and cultural commodities, on a food commodity that perhaps more than any other formed an empire. It is quite a methodological challenge […] to combine macro- and micro-history. The authors of this book have achieved that feat with remarkable success, allowing individual voices and personalities across several centuries to come through, even as they delineate larger historical processes including–but not limited to–European voyages of discovery and imperialism. What Empire of Tea does very well, thanks to its meticulous presentation of primary source materials scattered in rare book collections across the world, is to elegantly present the details of how this leaf conquered British savants, traders, tastes, and publics. 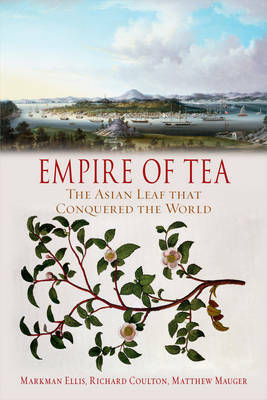 Empire of Tea highlights the connections between natural history knowledge and the development of this global commodity. From here, and freighted with a dazzling array of facts and figures, the book follows the trajectory of tea: from luxury commodity, through its career as a drink of the masses, to the present day. […] Underpinned by sound scholarship, and with such staggering statistics and nearly 80 illustrations to capture the reader’s attention, this book has got significant appeal and is a pleasure to read. Empire of Tea is a riveting account of a beverage that originated in China and Japan and “conquered the world” in four centuries. [… It] regales in describing the Asian leaf’s influence on politics, manners, commerce, philosophy, literature, even therapy. Empire of Tea is an extensively researched volume […] In a nutshell, this book encompasses the aromatic history of tea making its inroads into the British household. In a nutshell, what we get here is a quick history lesson on tea and its impact on world history. […] Although the book falls in the genre of history, it hardly feels academic or slow and is a gripping read. The authors take us on a wonderful journey to view tea’s role in empire-building by Britain and the response by the colonised. […] It is a deeply rewarding book. The authors of this fascinating history tell the brew’s history from a gendered, botanic and poetic point of view. […] The sheer wealth of information in the book is to be savoured over a refreshing cup of tea—whether Darjeeling, oolong, or Assam, is up to the reader. A book about an essential beverage […] Empire of Tea is a thoroughly researched volume. If that sounds stodgy, you’d be surprised at how readable it is. This fascinating history is well researched and entertainingly written in a beautifully produced book. Just the book, in fact, to enjoy, as this reviewer did, with his afternoon tea. Empire of Tea is not only thoroughly researched and written in a manner so that anyone will appreciate the rich story of tea behind what we take for granted, but the book’s illustrations from paintings and sketches are quite outstanding. Markman Ellis, Richard Coulton and Matthew Mauger have produced one of the most gripping historical and contemporary writings I have encountered in a long while. For those tempted to begin the tale of British tea-drinking with the Opium Wars, or with the establishment of Indian tea plantations, this book offers a richly textured history of the “empire” that preceded, and long outgrew, those events. Empire of Tea [is] a stimulating and attractively illustrated history. It’s a story of great scope. The genre of ‘The Food/Drink/Condiment that Made the Modern World’ (salt, spices, maize, cod, oysters, refrigerated beef, the battery chicken, the Big Mac) has become a cliché, and many performances of this sort are shallow, overstated or merely cute. But in the right hands, telling the history of foodstuffs and foodways responds to current calls for histories of wider scope: histories of the longue durée; of global exchanges and contacts between cultures; and of the relations between human doings, things and the environment. Empire of Tea is an important example, sometimes brilliantly told, worth standing alongside Sidney Mintz’s classic Sweetness and Power (1985) as a history of modernity told through one of its consumable commodities. ‘Tea’ has at least five meanings: the shrub Camellia sinensis; its leaf; the dried commodity; the infusion made from it; and the occasion for consuming the infusion. As Markman Ellis, Richard Coulton and Matthew Mauger show in this stimulating volume, history is steeped in the stuff. In eighteenth-century Britain, tea smugglers murdered customs officers; across the Atlantic, excise duty provoked the Boston Tea Party. In 1920, say the authors, John Maynard Keynes “imagined tea at the centre of the modern mercantile world”. With 290 billion litres of tea imbibed in 2013, the taste for it seems set to grow.